Working together, Mercedes-Benz Trucks and the trailer manufacturer Krone have transformed the concept of an "integrated approach" to reduce CO2 into reality in less than twelve months. The integrated approach involves everyone in the haulage sector playing their part in reducing fuel consumption: commercial vehicle manufacturers, body/tyre suppliers, logistics companies and, last but not least, political decision-makers. The two companies' development efforts on the integrated approach bring customers real benefits. The specific Mercedes-Benz Actros unveiled at the IAA 2016 features the efficiency package and the latest generation of the OM 471 six-cylinder in-line engine, Predictive Powertrain Control (the anticipatory cruise control system) and A-label low rolling resistance tyres. When combined with the new Krone "Profi Liner Efficiency" trailer, it promises a reduction in fuel consumption, and therefore CO2 emissions, of up to 20 percent compared to existing combinations. A standard semitrailer-tractor combination from 2014 forms the basis of this comparison. Mercedes-Benz Trucks and its partners launched the first Efficiency Run last year and were able to save up to 14 percent on fuel as a result in comparison to a standard semitrailer-tractor combination. Dr Wolfgang Bernhard, Member of the Board of Management of Daimler AG, with responsibility for Daimler Trucks & Buses: "In 2015, The Efficiency Run proved that the integrated approach works. Now, just one year later, we are putting products that are fit for series production onto the roads. 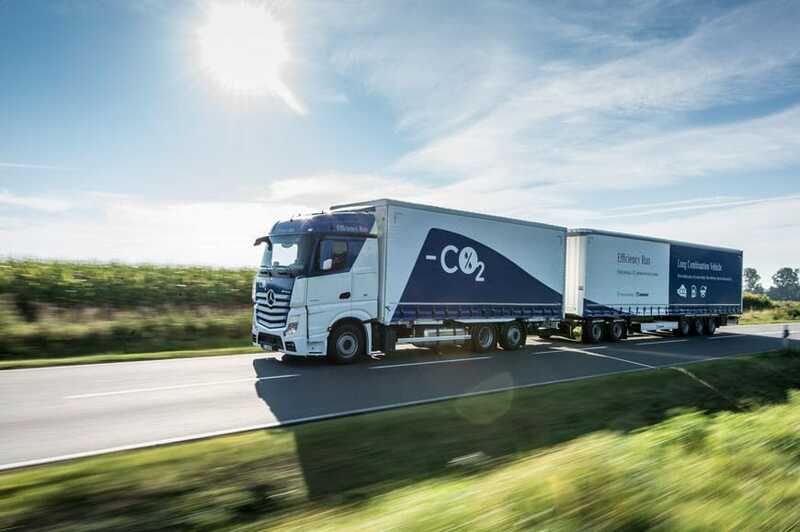 Our optimised semitrailer-tractor combination pays off for the environment and our customers: it lowers CO2 emissions and fuel consumption by up to 20 percent – and the cost can be amortised in about eighteen months." Gero Schulze Isfort, managing director of the Krone Commercial Vehicle Group, adds: "Working in partnership has moved us a decisive step forwards in terms of the integrated approach. Last year's Efficiency Run more than confirmed our expectations. We have subsequently further optimised our trailer, particularly with regard to everyday practicality. Thus, this year we were able to launch another field trial, now ended, which has resulted in a semitrailer that is fit for series production and is now going on the market – the Profi Liner Efficiency." Reducing fuel consumption, and therefore CO2, is currently one of the biggest challenges facing the haulage sector. In sectors outside the emissions trading scheme, of which haulage is one, the EU wants to reduce CO2 emissions by 30 percent by 2030. This demands enormous effort on the part of everyone involved in the haulage sector. However, the industry is convinced that it can accomplish this task – without statutory provisions – not just out of a sense of responsibility for the environment and society, but also driven by its customers. This is because lower CO2 emissions also mean lower fuel consumption, which represents a high cost factor for our customers. Back in 2008, European manufacturers formulated a vision to reduce CO2 emissions by 20 percent by 2020. It is essential, however, that this is cost-effective so that transportation by truck does not become more expensive and there is no impact on the European economy's competitiveness. The responsibility here lies not just with the manufacturers of tractor units, but rather with the entire trucking system. That extends to tractor units, semitrailers, tyres, fuel, operations, infrastructure and fleet replacement. The Efficiency Run is the best proof that this integrated approach works in real-world practice: compared to a standard semitrailer-tractor combination built in 2014, consumption could be reduced by 18 - 20 percent as a result. Thanks to the Efficiency Run, the package of measures being presented at the IAA to reduce fuel consumption and CO2 could quickly be transformed by Mercedes-Benz Trucks and Krone into specific standard products, which are already available to order. This increase in efficiency of up to 20 percent in total pays off for customers. Depending on the application and the vehicle service life distance, the extra cost of the trailer can be amortised in one to two years. This year, Mercedes-Benz Trucks and Krone organised a further three-month endurance test. As part of the Efficiency Run, five transport businesses tested the new optimised semitrailers in everyday operation: Grosse-Vehne, Elflein, Rhenus, Seifert and Wiedmann & Winz. In the course of this, the transport companies involved deployed their own Actros tractor units dating from 2013 to early 2015 from their fleets. These included two Actros 1845, two Actros 1842 and one Actros 1843. None of the five vehicles were specially configured for the three-month test run and no efficiency packages were implemented. The only on-board equipment was the FleetBoard telematics system into which Krone Telematics had been integrated including tyre pressure loss detection system, and Predictive Powertrain Control (PPC). Instead, the main focus of the field trial was on the completely new semitrailer attached to the five Actros models: the Krone Profi Liner Efficiency. It celebrates its world première at the 2016 IAA Commercial Vehicles show in Hanover, Germany, and is now available to order. ● New self-engineered Krone side panels made of impact-resistant plastic cover all the sides, including those of the three trailer axles, and improve the Cd value by 5.2 percent. ● A four-part rear wing, also made of robust plastic, improves the Cd value by a further 6.3 percent. ● A-label low-resistance tyres reduce rolling resistance. In comparison with last year's Efficiency Run, this test run did not look solely at fuel savings. Assessing the new trailer's everyday usability was a specific priority. This involves examining handling, noise emission, robustness, loading options and access. During the three months of testing, the five semitrailer-tractor combinations covered more than 150 000 km on German roads. They transported car engines, steel, paper, timber products and building materials – in short- and long-distance haulage. According to the drivers, the new trailer really proved its worth in tough day-to-day operation. Loading is possible from all sides and even from the top, and presents no problems at all. Using a forklift to load from the side works just as smoothly as with a conventional trailer, despite the side panels. No damage to the side panels was noticed at any time during the test phase. Reverse docking onto a loading ramp was also completed without difficulties. All that is necessary is to fold in the four-part rear wing before opening the rear-end doors. Based on feedback from drivers, this takes just a few seconds. They also made positive comments about the familiar operability of the lifting and lowering unit. The structural system for the side panels was singled out for high praise. It comprises five individual elements. These can be removed easily by hand at the height of the trailer axles – an important consideration when a wheel needs to be changed, for example. Even so, the lightweight plastic side panels (a proprietary Krone design) are so stable that they do not cause any wind noise. The side panelling is, of course, certified by the German Technical Inspection Authority (TÜV) and complies with legal requirements relating to the side underride guard. The side panels improve the Cd value of the Krone Profi Liner Efficiency by 5.2 percent. What's more, the rear wing improves the Cd value by a further 6.3 percent. These two benefits, in conjunction with low rolling resistance tyres, have an extremely positive effect on the Actros tractor unit's fuel consumption. An analysis of FleetBoard and Krone Telematics data showed that the optimised aerodynamics and use of A-label tyres reduced consumption by over five percent on their own. Krone's new efficiency specification will also be available for the Mega Liner, Cool Liner and Dry Liner in future. The new Krone trailer is not the only form of the integrated approach that will be presented in Hanover at the 2016 IAA Commercial Vehicles show. At the Mercedes-Benz Trucks stand, the latest generation of the Mercedes-Benz Actros featuring optimised aerodynamics due to a new spoiler lip, an optimised drivetrain and economical heavy-duty engines will also be on view for the first time. Of the new generation comprising three six-cylinder in-line engines, the most economical is the OM 471 with a displacement of 12.8 litres. The standard optimised Mercedes-Benz Actros with this engine variant consumes up to six percent less fuel. In addition to the new engine and transmission technology, the driving strategy also makes a noticeable contribution to lowering fuel consumption. Mercedes-Benz has been setting benchmarks for many years now with Predictive Powertrain Control, GPS data and topographic maps in conjunction with the Mercedes PowerShift 3 automated transmission, and with fuel savings of up to five percent. Now driving with PPC is even more efficient. The shift points of the anticipatory cruise control have undergone further optimisation. Internal tests by Mercedes-Benz confirm that journey times change only negligibly with the new strategy – in reality, the difference is of no significance. In contrast, the saving effect of the new driving strategy is quite tangible.